When I first started making books, one of the biggest challenges I faced was deciding which paper to use inside my books and where to find it. I also found (and do still find) myself overwhelmed with all the paper choices out there. Many of us order our paper online because we don’t live near a good art supply store, and it’s frustrating when you spend a lot of money on paper and shipping only to find that it isn’t the right fit for the book you had planned. In this blog post I’m going to outline what you need to consider when choosing papers for your books and I’ve created a downloadable guide which lists my 10 favorite papers and where I buy them. Before we get started we should talk about budgets. Now don’t get me wrong – I like to spend money on paper (just ask my husband), but when I buy expensive paper, I find it SO hard to actually use it in a book. If I’m creating a special photo album or gift then I spend more on some fancy paper but generally I choose good quality, acid-free, easy-to-find papers for my everyday books. The most important thing to decide upon when choosing the paper weight is what medium you plan to use. If it’s a dry medium, such as pencil, graphite or colored pencil, use a text weight paper (70lb/105gsm), sketch or drawing paper. If you plan to use pens, markers or fountain pens, then choose a heavier weight version (80lb/130gsm). If you plan to use any kind of wet media, such as ink, sprays, watercolor or acrylic paints, choose a sturdier paper that will hold up to the water without buckling, such as a 98lb/160gsm mixed media paper or for wetter work a 140lb/330gsm watercolor paper. If your budget allows, a 100% cotton paper is lovely for this type of work. 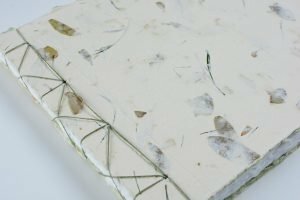 Calligraphers love the thin (52gsm) Japanese paper called Tomoe River and if you’re creating a photo albums or scrapbooks, a 80-100lb cover paper (heavier than text papers) is a great option. Also, consider your medium when choosing the finish on the paper. At the one extreme are cold pressed and handmade watercolor paper which is highly textured and fantastic for some styles of painting and at the other extreme are smooth (sometimes called flat or satin) papers which show details wonderfully and are a good choice for writing. Those who draw often choose something with a little tooth (sometimes called eggshell). I once made a sketchbook from handmade watercolor paper and tried to use colored pencils on the pages – big mistake. There were so many ridges in the paper that the pencil ‘skipped’ over these areas creating a patchy mess! If you’re creating a travel journal or notebook that’s intended to be portable, then it will need to be smaller and easier to handle. If your book will stay in an office, home or studio, then you can go with a larger format. Having said that, some people just like to work large or like to work small, so consider what size book has worked well for you in the past. With this in mind, choose paper sized for your project. Without a very large paper cutter or guillotine, it can be unwieldy to cut huge sheets of paper down for a small 4″ x 6″ book. Instead buy pads or pre-cut sheets that only require you to tear or make a few cuts. When you purchase paper from a good online paper supplier, they will let you know the grain direction in the description. If not, it’s worth checking with the supplier before they ship it to you, especially if you’re planning a very specific project with it. I forgot this recently and ordered 500 sheets of 9″ x 12″ paper only to find that the paper was grained long, which meant that the widest folded signature I could make was 4.5″. 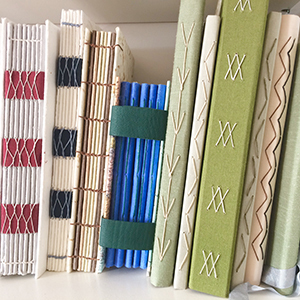 I had been planning to make 6″ x 9″ books. I should have checked! 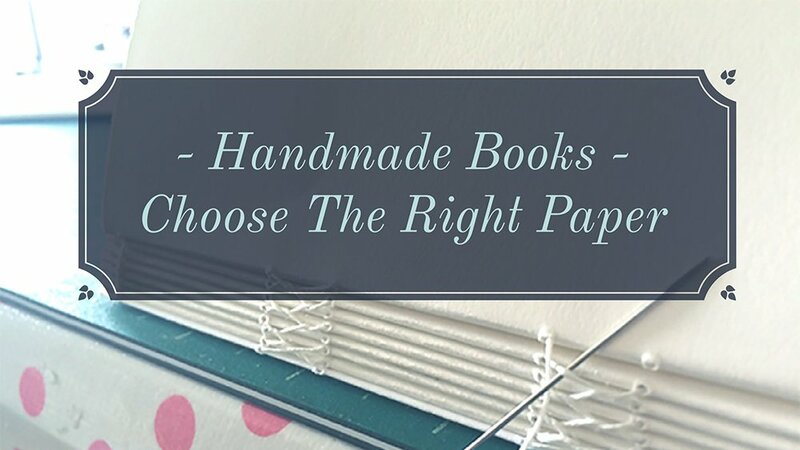 I hope this has helped get you started on choosing the right paper for the right book. Please leave questions and comments below – I’d love to know your thoughts, especially if you live outside the USA and have some recommendations. Click the button below to get my newsletter and the downloadable lists of my favorite papers.